The sugar industry, as one of the most regulated food industries in the EU, has been given great challenge due to the sugar quota elimination in 2017. 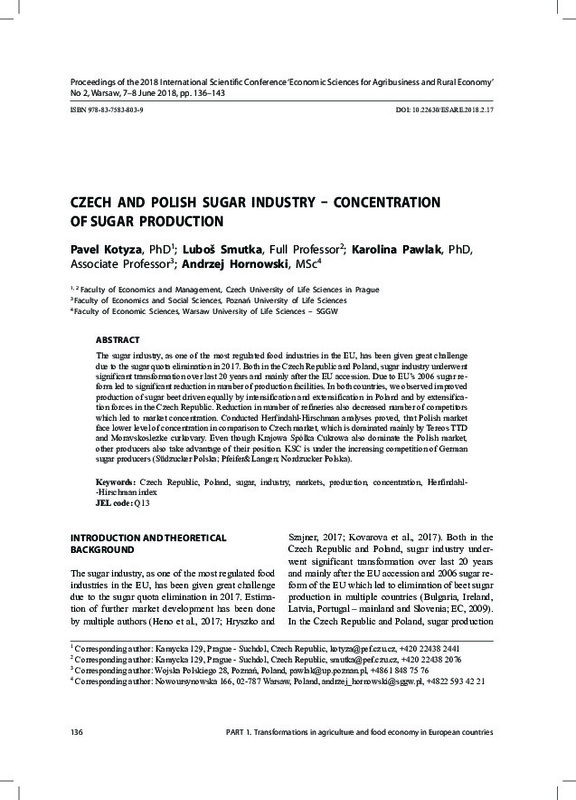 Both in the Czech Republic and Poland, sugar industry underwent significant transformation over last 20 years and mainly after the EU accession. Due to EU’s 2006 sugar reform led to significant reduction in number of production facilities. In both countries, we observed improved production of sugar beet driven equally by intensification and extensification in Poland and by extensification forces in the Czech Republic. Reduction in number of refineries also decreased number of competitors which led to market concentration. Conducted Herfindahl-Hirschman analyses proved, that Polish market face lower level of concentration in comparison to Czech market, which is dominated mainly by Tereos TTD and Moravskoslezke curkovary. Even though Krajowa Spółka Cukrowa also dominate the Polish market, other producers also take advantage of their position. KSC is under the increasing competition of German sugar producers (Südzucker Polska; Pfeifer&Langen; Nordzucker Polska).